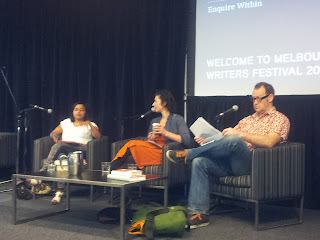 Any one who has spent any time reading my blog over the last couple of weeks may have noticed that I spent a bit of time at the Melbourne Writers Festival. It is all over for another year which is disappointing but I did really enjoy all the sessions I went to and can't wait for the excitement to start to build towards the next one. Last Sunday I attended two sessions. The first was a free session on Sunday morning called Cooking the Books, and the second session, which I hope to write up for tomorrow was on books as Beautiful Objects. Whilst I did take loads of notes and could do a huge post talking about what each of the various panellists said I thought that instead I would try to do a brief wrap up (although I am not that great at brief) and then share the three things that I came away with from the session. Here goes. The two panellists were Dani Valent, a freelance journalist who writes restaurant reviews and has also written a couple of Thermomix cookbooks and prominent food blogger Ed Charles who now provides media consultancy services to restaurant. The moderator was broadcaster Bhakthi Puvanenthiran who classifies herself as a passionate foodie! The first question asked was who are the recipe writing heroes? The discussion focused on the fact that a good recipe can be far more than a list of ingredients and instructions. It should be a balance between the dish and journey. Throughout the session, the panellists read a number of recipes and quotes. The first was from Elizabeth David for Fish in Butter Sauce which they loved because the recipe gives the vibe and the cook permission to manoeuvre a little as well as showing the authors own personality. That doesn't mean to say that there isn't a place for sensible writers but that there is room for both. Dani also mentioned that she really enjoyed recipes which told her something about the time that the recipe was written in. For example, she read a recipe from Soyer's Shilling Cooking for Little Milk Cakes for Breakfast where the final step in the process was to "glaze with a red hot shovel". I don't know about you, but I can't remember the last time I had one of those handy in my kitchen! When talking about memoir, the panellists talked about loving to get inside the kitchen with authors like Anthony Boudain, Giles Corenn, Gabrielle Hamilton (Blood, Bones and Butter), Fuschia Dunlop (Shark Fin and Sze Chuan Pepper) being amongst those named. The conversation then moved on to what makes a good food critic (an ability to see beyond how they are being treated to how other people in the restaurant are being treated being one key) to what makes a good restaurant review. One of the points raised that some critics miss the point that the review is really for an ordinary person to decide whether they want to spend their hard earned money in the restaurant or not, something that some restaurants forget as well at times. Dani Valent conceded that there is a formula to a degree as you need to answer a number of broad questions, but she is also aware that she wants her reviews to be a good piece of writing. She also needs to be careful of what she says that may make the publication vulnerable to being sued by the restaurant. Moving onto food in novels, it was agreed that food can really be used to tell about the time, for example as shown by Pepys and Dickens, and also about the characters like the way that Graeme Simsion used the structured food regime to illustrate his character of Don Tillman in The Rosie Project. It does raise the question of what people will think of our time if you start thinking about the protein shake that has been developed to meet all nutritional needs etc. So what were the three things I learnt? The first is that I need to read Nigel Slater. All three of the panelists were quite effusive in their praise of him both as a writer and a foodie. Unfortunately my library doesn't have any copies of his books so I will need to request one via interlibrary loan. If I like the books I may in due course try some of the videos that are around! Ed Thomas talked about how reading a Nigel Slater cookbook or memoir makes you feel cosy and comfortable and this could be seen in a quote about mashed potatoes which he read. Like many good recipe writers, he shares emotions as well as instructions and techniques. The second is that if you look hard enough you can most likely find food bloggers who are blogging about your area including doing restaurant reviews. I often struggle to think of places to go where there is really good food in my area but it never occurred to me to see if there were people who choose to blog about exactly this. This may be because I am very book blog focused! There were several blogs that were mentioned for my area, including a dad and son who visit establishments throughout the western suburbs of Melbourne and then share their thoughts at Consider the Sauce. I have found three different places I want to try within 5 minutes of my house just by doing a search on their site! Another with a western suburbs focus is the Footscray Food Blog, the author of which is now running food tours in Footscray, a very multi cultural inner city suburb, which sound fab! The third thing, and where I want to focus on for the rest of this post, is a website called Eat Your Books. In the conversation, this as mentioned in a kind of throwaway line where one of the presenters said I assume you all know about Eat Your Books? There must have been lots of blank faces in the room as they then went back and explained it a bit more. The way it was explained was that it was a site where you scanned in the barcodes of your cookbooks and then when you are looking for a recipe for, say, chicken then it would come up with a load of recipes for chicken that come from your cookbooks instead of having to look through multiple books until you find something of interest. I walked out of the session thinking I have to check this site out. As you might expect there is a blog which features different topics (recent posts include discussion about whether chicken should be rinsed or not, top tips, a new cookbooks round up which included not only American but also UK, Australian, Canadian releases), twitter stream and links to forums. For the purposes of writing about Eat Your Books, I added a Nigel Slater book to my bookshelf. From the index of recipes that then comes up when I add the book to the shelf I know that there is a Frosted Marmalade Cake in that book. From what I can tell, how you are meant to use it is that you think, hmmm, I have a surplus of marmalade what can I make from it. In the search box you put your ingredient and it comes up with a list of recipes, or you can search by author name, recipe title or book title. Whilst it doesn't give you the recipe, what it does do is narrow down the time spent wondering now which book did I see that recipe in. You can then also push the ingredients out into a shopping list and then add your own notes and reviews once you have made your dish, build a list of favourites and more. I am sure that there are lot of other features that will be useful. I have only just started playing with the site myself and will play some more to see what I can find over the coming weeks. There are help tips throughout the site, and apparently some videos although I couldn't get them to play. I am not sure if that was because of my laptop or the site though. There is also a mobile app version but I haven't looked at that yet. In terms of the cookbooks that have been indexed so you can see all names of the recipes, there does seem to be a large number of them, but I don't know how comprehensive it is. For example, I own a cookbook by an Australian author that I can not find at the moment. I know it is in this house somewhere, and I know I want to cook out of it and I want to see if it has a particular recipe in it but I have no idea where it is. I thought I would see if it is was in the database but it wasn't. The database does also include magazines, popular blogs and you can add recipes from other sources so that they come up in your searches if you wish. It does helpfully suggest I could index the book myself if I want. If only I could find it! I should mention that there is a cost. 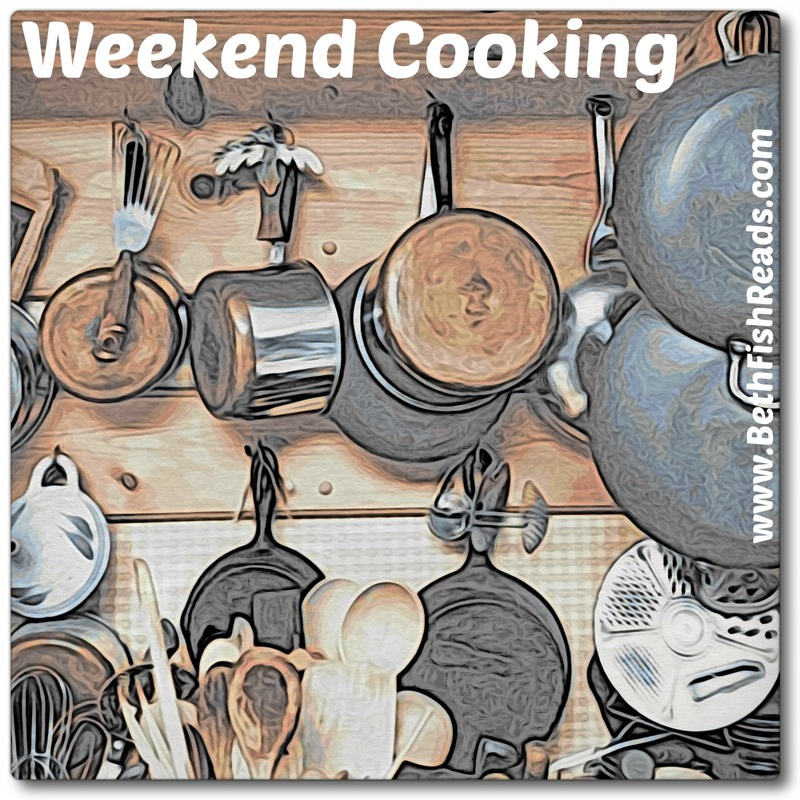 You can join the site for free and that allows you to have up to 5 cookbooks on your shelf at any one time. You can also pay $2.50 a month or $25 (US) per year to give you space to be able to list all of your cookbooks. Do you use Eat Your Books? If so, what is your favourite feature? If not, does it sound like something that might be useful? Such an interesting post, thanks for taking us along with you. I love to go to book events, and books events about food books are even more fun. I have never heard of Eat Your Books, I'm going to have to check that site out. Thanks bookchickdi! I was glad to see a foodie event on the Festival program! I looked into Eat Your Books a while ago and considered giving it as a gift to my husband, but then he got too busy with work to do much cooking from cookbooks anymore and I didn't get it. A few years ago, I took an indexing class in library school and created an index of low-carb recipes so that I could look up by recipe title or main ingredients and see which cookbook the recipe was in. It was a fun and useful homework assignment, but I think using Eat Your Books would be a lot easier! I am all about convenience when it comes to this kind of thing Laurie! What a great event. Eat Your Books is new to me. Great idea about the food bloggers in my area. 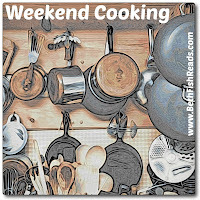 I've known some that were more about cooking (and they have terrific parties! ), but I should look into restaurant reviews. I had known about cooking bloggers too, but never actually thought about looking for restaurant reviewers Joy. This is a fascinating post! I'm not familiar with Eat Your Books, but will spend some time looking around there - thanks! Carole, I am looking forward to reading him myself! 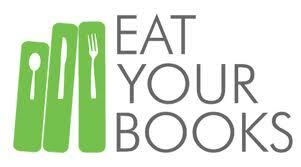 I like the sound of Eat Your Books but the Australian aspect bothers me. One of the things I noticed when I joined GoodReads was that they never had any of the Aussie books I was reading. I was able to apply to be a 'Librarian' and so now I can add my books, but it's still a pain. I never did join Audible (the audio book people) when I got my Kindle because when I emailed them to ask if they had any Aussie titles, they never even bothered to reply. Lisa, I ended up trying lots of Australian titles. Most of them were there but there were a few exceptions unfortunately. What a fabulous post Marg, I'd have loved that session! I'm going to do some more searching for food bloggers in Brisbane, what a great idea. A while ago I came across a great blog that covered Deli's, specialty gourmet produce and fresh food markets in Brisbane, a fantastic find. Eat Your Books sounds good, I'll check it out but I don't think I'd pay an annual subscription. Teddyree, I am not sure I am going to pay an annual subscriptions either but never say never! You've got so much out of this festival, Marg - I feel like I've missed something great. I love Nigel Slater's writing - he was big in the UK when I lived there in the late 90s, and I have a lot of his books. I find his recipes simple and delicious. His memoir, Toast, is also quite lovely. Vicki, I was in the UK in the mid to late 90s too but I don't really remember him at all! Toast was one of the books that the panel read passages from. Every since I saw a movie about Nigel Slater (I reviewed it for Weekend Cooking but am too lazy to search for the title right now), I've wanted to read his writing and his cookbooks. I have an Eat Your Books subscription but haven't used it. Sounds like I should! Beth, at least play with it a bit and see what it can do for you! Will have to keep an eye out for the Nigel Slater movie. What a fabulous and interesting post. So much to think about. 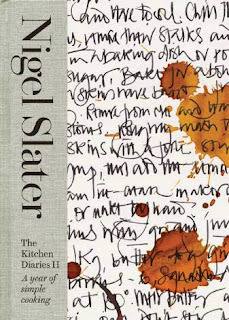 I was quite sure that I'd read Nigel Slater, but while I know I have him on the TBR shelf, it was Julian Barnes that I was thinking of (The Pedant in the Kitchen- also a great foodie read), I must get to Nigel sometime too. I hadn't heard of Eat Your Books either- it does sound great. Like Lisa I would worry about the Australian content. I have many, many cookbooks so I've kept an index book for many years, decades I'm sure, where I keep track of where particular recipes are because I couldn't trust it to my failing memory. It wouldn't cover magazine recipes I guess either, which I can easily put in my index book. I tend to use my blog to keep track of recipes I want to make again! Thanks for this post. I have never heard of Eat Your Books, but I am heading over to check it out.